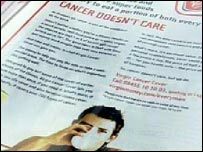 BBC NEWS | Programmes | Is cancer insurance 'voodoo' ? Is cancer insurance 'voodoo' ? Insurance companies will insure you against more or less anything. The Health insurance industry alone is worth an estimated £3.2bn a year and now it is actually possible to insure against specific illnesses. One company even offers cash cover to anyone who develops cancer. But is this useful insurance to have at a time when cancer is such a big killer or is it just playing on our fears about the Big C? Insuring against specific illnesses is common in America, but it is still quite a new concept here. Jason Wyer-Smith, from Virgin Money explained why his company is one of the few firms offering this cover. "Critical illness insurance has always been very expensive and sales were declining. "This is a low cost alternative. Cancer accounts for 65% of critical illness claims. He denied that is was preying on peoples' fear of cancer, stating, "This policy offers peace of mind to the consumers." Someone who understands the cash cost of cancer is Chris Norman, who developed Hodgkins disease when he was 27. Chris, who had to quit his job, did not realise the extra costs involved such as travelling to the hospital and parking. "I had to do a 60 mile a day round journey every day for 24 days for radiotherapy," he told BBC One's The One Show, "it cost me a fortune." "I had no sort of insurance at all. I ended up so skint I had to move back into my parents' home as I couldn't afford to keep my own place. Those at the sharp end of cancer care, Macmillan Nurses think that the government should do more to financially help sufferers. Ayesha Owusu-Barnaby from MacMillan said: "Rather than those at risk taking out insurance policies - which may have caveats in the small print to reduce pay-outs - we, would rather the government ensure that financial aid and employment protection are available to all. "Macmillan's research shows a cancer diagnosis can have a devastating effect on people's finances, leaving many struggling with extra costs. It is the small print on these policies that you really have to read. Virgin will only cover you up to the age of 69, or in other words when you are in the lower risk bracket. The amount they pay out depends on the severity of the cancer. 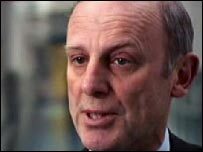 However one of the UK's leading cancer specialists is sceptical about the value of cancer insurance policies. Prof Karol Sikora told The One Show that even cancer experts found the cancer insurance policies difficult to understand. He pointed out one of the disadvantages of the Virgin policy. "Most cancers are early and they are picked up early and if that happens with Virgin you only get 10% of the money you thought you were going to get. "What people don't understand is that cancer is primarily a disease of old people - the average age you get cancer is 68." Virgin's Policy stops at 69-year-olds a policy defended by Jason Wyer-Smith. "Up to 69 you have a one in six chance of getting cancer. After 70 it drops to one in three - that level of risk is financially unviable." He said linking payouts to the severity of the diagnosis is a key feature of its cover and keeps premiums low. "It is wrong to suggest that this is not clear in our brochures or that our customers expect a large windfall type payment if they are diagnosed with a very treatable, early stage cancer," he added. Prof Sikora's advice is not to bother with such policies. "People are so frightened of this disease, they think by having the policy it is not going to happen to them - I think that it is a voodoo way of dealing with cancer." Mr Wyer-Smith responded: "No one wants to get cancer, have a car accident or have their home flooded or robbed but sensible people take insurance against these things happening just in case they do. "It's not Voodoo it's responsible." The Association of British Insurers Protection Committee thinks that whilst Virgin's cancer insurance may not be the best answer, it has had a positive effect on the insurance market as a whole by lowering premiums. For more information watch The One Show, BBC One, Tuesday 5 February 2008 at 1900 GMT.